see more definitions of what is self esteem. Your self esteem is build upon the thoughts and feelings you have about yourself. It is a self-evaluation, an opinion of who you are, build on experiences in your life and the conclusions you made, whether or not under pressure of peers. To mention thoughts and feelings is essential because those are the ingredients self esteem is build upon, whether it is high self esteem or low self esteem. Beliefs are made of thoughts and feelings and your beliefs determine your behavior and actions and consequently your results in life. So although your self esteem derives from your past life's experiences it is also at the core of your future events. And that is because you create your reality, and consequently your future, yourself. So what is self esteem? It is all about what you believe about yourself. It's all about your believes-system on the 'neurological level of identity'. 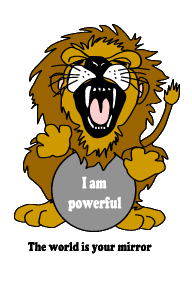 To say the words 'I am ..' is a very powerful way to manifest that in your life your are mentioning. And again it creates your future. Let me tell you some more about this fascinating phenomenom called belief. A belief is a way you see something, a viewpoint, with a feeling of certainty. And because you feel certain about it you can only see it that way. And that way, you see it in your mind, is the way it is, or will be manifested, in this physical world. It is not 'seeing is believing'. It really is 'believing is seeing'. You constantly get the evidence of your being right about what you believe. So, what you believe is what you get in life. If you are not happy with what you get, change your beliefs . It really is the only lasting way to alter your circumstances and get the best out of life. There are many ways to explain this further. You might say that your perceptual filters, based on your beliefs, cause you to only see it the way your beliefs indicate it. The filters make you distort, generalise and/or delete information so the outside world will match your beliefs. The filters make you see it as you believe it. Another approach, I like a lot to examine what is self esteem, is the concept of the law of attraction as an explanation of the sturdiness of believes. Because a belief consist of thoughts and feelings it has some energetic vibration. The vibrational tune of the inner belief resonates with according vibrations in the outside world. And consequently we pick up those outer vibrations with our five senses. It's a vicious loop where there seems no way out. I believe it so I see it. I see it so I believe it. You see, hear, feel, smell and taste what you believe so it must be true and you believe it even more. But I guarantee, if results do not show up the way you would like them to be, there surely is a way out. For you can change your beliefs about yourself, so a new outcome will appear. What is self esteem? What you believe about yourself and you can believe anything for anything is possible.